LG is throwing a curve into the smartphone mix, and OtterBox is standing right alongside this innovation. FORT COLLINS, Colo., Feb. 6, 2014 /PRNewswire/ -- Just when smartphone technology seemed to be on the straight and narrow, LG throws in a curve. The new LG G Flex redefines the shape of innovation with the first curved and flexible smartphone. OtterBox®, the No. 1-selling case for smartphones in North America*, announces availability of the Defender Series® and Commuter Series® for LG G Flex. Designed to contour to the face for comfortable communication, the G Flex provides a wider panoramic view on its six-inch OLED display and enables multitasking with its powerful CPU. In keeping with a tradition of enablement and enhancement, the OtterBox Defender Series and Commuter Series cases for LG G Flex are designed to optimize the full functionality of the device, including the ability to flex under pressure. The materials and construction of the cases allow them to move freely with the device while still providing a cushioned, precision fit. "LG is throwing a curve into the smartphone mix, and OtterBox is standing right alongside this innovation," said OtterBox CEOBrian Thomas. "We partner with trendsetters like LG who push the realm of possibility in handheld technology and look forward to the new possibilities that curved glass technologies offer." 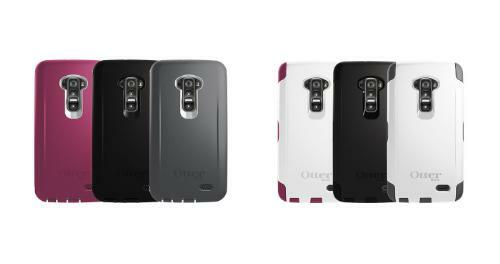 For more information about the OtterBox Defender Series and Commuter Series for the LG G Flex, visit otterbox.com. Starting with something as simple as a box, OtterBox® was founded in 1998 with a line of indestructible dry boxes. Today, OtterBox is the No. 1-selling case for smartphones and offers an extensive lineup of premium screen protectors and other device-enhancing accessories that complement various consumer lifestyles. OtterBox's strong relationships with the leading mobile device manufacturers, retailers and wireless services providers delivers unrivaled value, world-class customer service and a continued commitment to premium product quality. OtterBox has been a six-time honoree on the Inc. 5000 ranking of fastest growing private companies in the U.S., recognized by Forbes Magazine on 'America's Most Promising Companies' and is a repeat honoree in the Great Place to Work® annual survey published by FORTUNE Magazine. The family-owned, private company has global headquarters in Fort Collins, Colo.and offices in Boston, San Diego, Cork, Ireland and Hong Kong. ** Defender Series does NOT protect against water. Will provide added protection against drops, bump and shock. Commuter Series does NOT protect against water. Will provide added protection against bump and shock. ©2014 Otter Products, LLC. All rights reserved. The OtterBox name and OtterBox trademarks are the property of Otter Products, LLC, registered in the U.S. and other countries. All other trademarks are the property of their respective owners.